Abstract: Scythe made the Orochi heatsink large for a reason, so that it can be paired with a slowly rotating ultra quiet fan to gently move air through the massive heatsinks' fins. The Orochi is made for silent operation, and for all intents and purposes it achieves that goal. 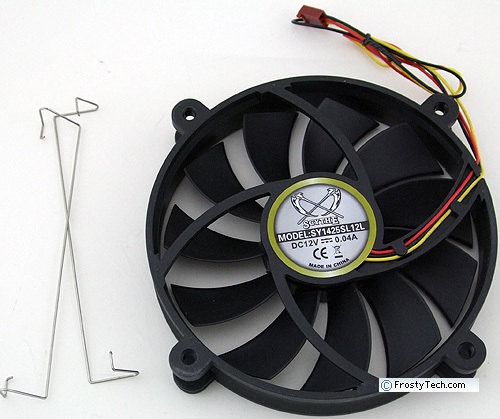 The 140mm diameter 500 RPM fan is basically inaudible in practice, and when it comes to the number of heatsinks that can keep a 150W heat load in check while making less than 30 dBA noise, the list is pretty short. Read the companion article where Frostytech mounts a mil-spec aerospace grade fan on the Scythe Orochi. Constructed of nickel plated aluminum fins pierced by no less than 10 copper heatpipes, the Scythe Orochi heatsink elevates the bulk of its voluminous body above a small copper base and compact extruded aluminum heatsink. Where the Orochi meets the processor the ends of the heatpipes are stacked in two's, and soldered to a thick chrome plated copper base. The Scythe Orochi heatsink weighs in at 1155 grams, which is way beyond the recommended Intel/AMD specs for a heatsink. It retails for about $62USD. A handful of interchangeable brackets allow the Scythe Orochi heatsink to be used on Intel socket 478/775 and AMD socket 754/939/940/AM2/AM2+ processors. Installation is surprisingly easy, and predominantly tool free. 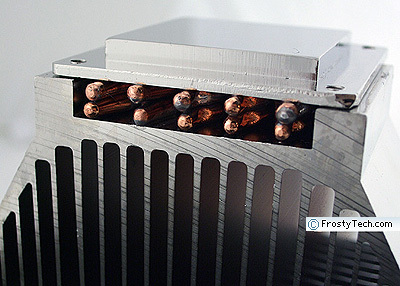 Materials: Aluminum fins, copper heatpipes, base, extruded aluminum base cap. Printed instructions come with the Scythe Orochi heatsink that detail the installation steps on both processor platforms. It's not complicated to install, although Intel 775 users will need to remove the motherboard from the case to install a metal rear support bracket first. Scythe pack ten 6mm diameter heatpipes into the Orochi heatsink. 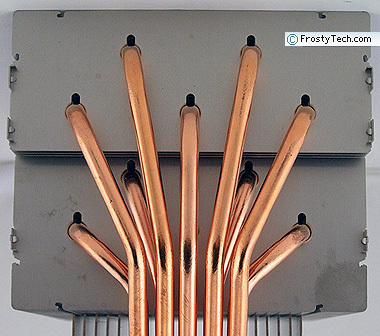 The copper heatpipes run from the base of the heatsink to the fins, and fan out to two different levels. 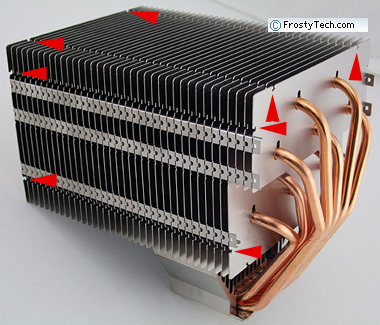 The bottom-most heatpipes, those in direct contact with the base, conduct heat energy the furthest to the upper areas of the cooling fins. In other words, the most heat goes to the area of the aluminum fins which receives the most airflow. 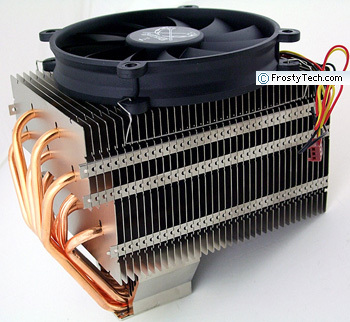 The second tier of heatpipes are soldered to an extruded aluminum base cap, and fan out to the lower portion of the large aluminum fins. All joints are soldered for good thermal conductivity. With the number of heatpipes in use here, there are obvious questions about how effective the stacking of heatpipes is. After all, heatpipes are ment to conduct heat from one end to the other, not necessarily in the axis perpendicular to the direction of the pipe. 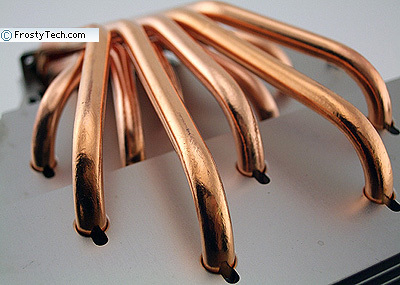 The Scythe Orochi heatsink comes with clips for Intel and AMD processors. Depending on your computer, one clip or the other is attached to the base of the heatsink with four screws. 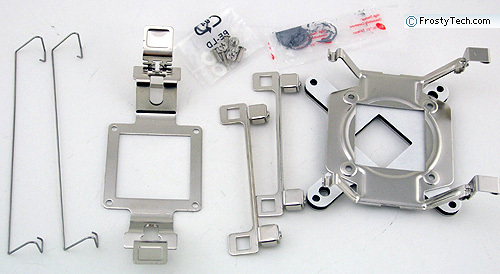 The socket 775 clip uses four springy clips which grab onto a pair of metal brackets which are installed onto the motherboard. For this, you'll need to pull the motherboard from the case first, to place a metal rear-support bracket and screw everything down. Once that's done swapping out CPUs isn't a problem - a tool-free clip system provides quick access to the CPU below. The AMD bracket works with the center lug on socket AM2 and socket 754/939/940 heatsink retention frames. The only step required is attaching it to the bottom of the Scythe Orochi SCORC-1000 heatsink. There is one guideline regarding the orientation of the heatsink when it's installed, since the CPU brackets are multi-directional just be sure to fit everything together so the heatpipes are not at the top of the case. A single pair of wire fan brackets come with the Scythe Orochi heatsink, however there are three different sides the fan can be installed onto (red arrow below indicate two sides).